We have a long, dark hallway that has overhead lights, but those are too bright to leave on all night. There are a couple of outlets along the hall, and I’ve thought about buying some LED night lights to light up the hall at night. I’ve hesitated to do that, because the hall is narrow, and I’m afraid someone or something would knock into the night lights and damage them, the wall, or the outlets. This Kickstarter project is the solution for my dark hall. The SnapRays Guidelight from Snap Power looks like normal outlet covers, but they have LEDs embedded in the bottom edge to serve as a night light without tying up one of the outlets. These outlet covers have “patented ‘Power Extractors’ on the back side of the Guidelight that slide into the electrical box and around the outlet receptacle, making contact with the sides of the outlet. 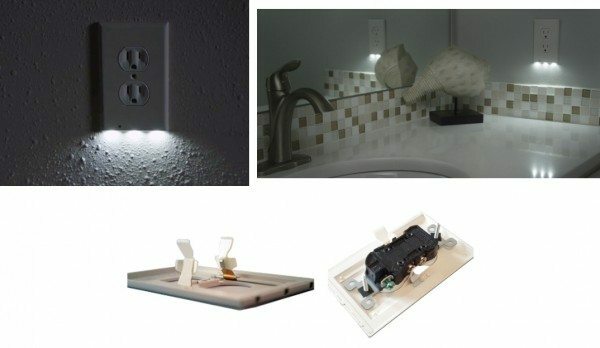 This proprietary technology is what enables the device to extract power from the receptacle without having to hardwire, plug into, or occupy an outlet.” They have a light sensor that turns the night light on when it’s dark and off when it’s light. They are UL approved, and they use only 5 milliamps of power and cost only pennies to operate for a year. The SnapRays Guidelight project met its funding goals within two hours, but there is still plenty of time for you to support the project and get your own Guidelights. A $12 pledge gets you one Guidelight in either decor or normal duplex style, $24 for three, or $40 for five. Shipping is expected to begin in May, 2014.
the photo in a fully remodeled bathroom is a bit misleading… they do note in the kickstarter that they dont work on GFCI plugs which is a shame. I was going to put in a order for the kids bathroom. Any outlet that close to a sink needs to have GFCI so you dont electrocute yourself. frowny face. It is a GFCI outlet with an LED night light built in. The night light is controlled by a sensor so the night light is only on when when the room is dark. I just installed it in my bathroom and it works well. It is EASY to install a receptacle. As long as your not changing anything else you just unscrew the existing wires and screw them into the same place in the new receptacle. Depending on how your bathrooms are wired, you may be able to relocated you GFI to a different outlet on the same loop. @Slove – I have to say the concept of this product if very simple. It provides something that has already been done a bijillion times already by every nightlights and glow plug in existence since the invention of the outlet itself. However I am very impressed with the design and engineering that went into this. Hopefully the designer sees this. I will probably get a set for the kids rooms. I like the idea of a night light that can not be removed or played with (for safety). But I would like to see the product taken one step further. I would love to see a rechargeable battery or super capacitor incorporated into the design. In the event of a power outage the LED’s would remain on for an hour or two. In case you have not been following closely, they said the gfci will come later. Do you really think that my wife can rewire a gfci plug? Not a chance.. These cover plates anyone can install. I’ll just wait until the gfci one comes out for those plugs. Until then, I’m going to light up my plugs in halls, rooms, and other places. I go through the cheap lights at Walmart like crazy with my kids playing with them. Note one might check with local power authority.Apparently these are not valid in province of Ontario to place these type of outlets near sinks as they don’t seem to have a breaker or tripping system.